The report, from the January 19 Western Forest Industry Conference in Vancouver, Washington, cites details on the fallout from the pine beetle infestation, a major factor behind the shrinking sustainable harvest rate/annual allowable cut (AAC) in this province. The most significant impact will be felt in the BC Interior, where it’s estimated 80-90 per cent of merchantable pine was killed. Salvage logging in the region is winding down as the availability of economic, beetle-killed timber peters out. While AAC reductions were anticipated, “it was always somewhere in the future,” said Ekstrom. “Now it is actually going to happen.” BC’s chief forester is expected to announce cutbacks in Quesnel in March, Prince George in June, and Lakes, west of Prince George, in late 2017. Meanwhile, economic forecasts suggest US housing starts will continue to climb in 2017. In China, softwood lumber imports reached an all-time high in 2016, “fueled by growing demand for use of lumber in the furniture, door, window and finishing segments” (International Wood Markets 1/23/17). At the same time, questions related to how optimism for overall demand will play out in the face of the Canada-United States softwood lumber dispute, as curtailments and shutdowns loom, remain unanswered. Anyone know where this tree is located? We can probably rule out Quesnel. Its certainly got a mind of its own, with a natural defence against sawmills bent on producing dimension lumber free of crook. Update: Solved! 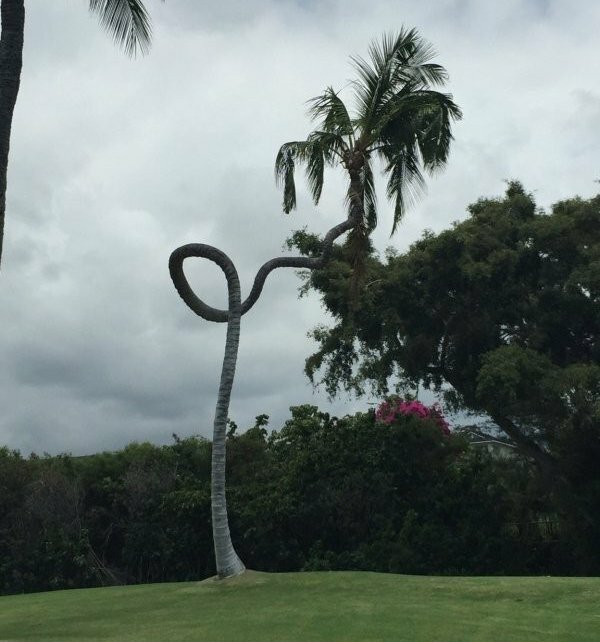 The tree is located in Kona, Hawaii, at the Kona Country Club. Thanks to Ian White of Dakeryn Industries, who even shared his own picture of this tree! This entry was posted in Industry and tagged bc forest, BC Sawmills, Forest Stewardship, forestry, SLA, Softwood. Bookmark the permalink.